Refik Kozic was born December 25th, 1951 in Backo Novo Seto, Yugoslavia. He started his professional career at Yugoslavian second division side Istra at the age of 17 years old in 1968. He played with Istra for two full seasons before serving a year of military service and then signed for Partizan Belgrade in 1972. He went onto play 350 games during his eight years with the club. In those eight years, he played on two league championship teams 1976 and 1978, he also participated in two European Champions Cup campaigns 1976 and 1978. He also saw action in the UEFA and Cup Winners' Cup competitions. The Rowdies acquired Refik from Partizan after a brief trial in February 1979, on the recommendation of Rowdie Petar Baralic. He would make his Rowdies debut in the 1980 outdoor season, which was a season of consistent excellence, he played every minute of the 36 games - an unprecedented 3325 minutes, and scoring 2 goals and 3 assists for 7 points. He was named MVP in his inaugural Rowdies' season. He would make his NASL indoor debut during the 1980-81 season, going on to make 16 appearances, scoring 3 goals with 7 assists for 13 points. He had played in some indoor soccer on an exhibition level in Yugoslavia. He would play every minute of the 1981 outdoor season - 3367. He also scored 5 goals that season, most of them coming off set plays. Earning him 10 points. In the 1981-82 indoor season, Refik would make 21 appearances, and scored 6 goals with 12 assists, for 24 points. The 1982 season would see him start on the bench for the first few games, but he handled it like a pro and worked his way back into the lineup with versatility and tenacity, sometimes in defense and often in midfield. He would appear in 25 games -1941 minutes of play. He also found time to get his USSF "B" coaching license, putting it to good use, coaching the Suncoast Soccer League Patio Pools. During the 1982-83 Grand Prix of Indoor Soccer, he appeared in 7 games, scoring only 1 goal. He started in 16 games for the Rowdies, 14 of them at center back during the 1983 outdoor season. Scoring only 1 goal. He then left the Rowdies for a short stint with the indoor New York Cosmos, but returned to the club prior to the 1984 outdoor season in a trade for Pedro DeBrito and cash. He would appear in 21 games during his last Rowdies and NASL season. 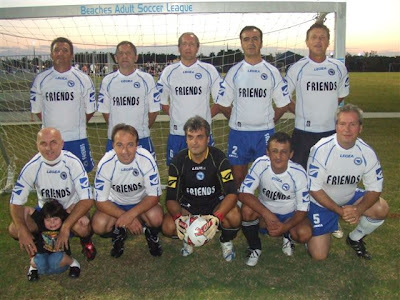 Refik still plays soccer today, for "Friends", an over-40's team in the Beaches Adult Soccer League. He has been blighted with serious health problem over the last decade, including heart problems. He has also had both knees replaced as well, yet remains a very strong and physical player. Refik's latest business enterprise is called "Lana International". 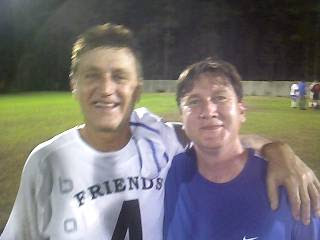 Here is Refik pictured with Mike Cornell after a game played last Wednesday, December 10th, 2008. Refik's team beat Mike's team (Real Mandarin) 12-0. Thanks to Mike Cornell for the photo.